It was Sunday morning in the village of Santiago Atitlan, Guatemala, and I was concelebrating Mass with the pastor. Almost all those at the Mass were Tz’utujil Mayans, sharply dressed in their Tz’utujil traditional clothing, women in bright colored woven skirts and embroidered blouses, and the men in their vertical-lined white “pantalones,” often embroidered as well. The men also sported large, brightly colored sashes around their waists and big cowboy-style hats, which they wore to and from church. Right after Communion, several men came up to the altar. Each received a pyx with a Communion host to take to the sick. They then walked out of the church and into local neighborhoods, each accompanied by another person with a votive candle, heading to visit homebound individuals. The Mass had ended, but the celebration of Communion continued. Of course, we don’t have to go to Guatemala to find extraordinary ministers of holy Communion take the Eucharist to the sick. But seeing these men walk the distance and carry the hosts throughout the streets was especially inspiring. Any discussion of the Eucharist as a sacrament has to address more than the reception of the Lord in Communion. Like the ministers whose ministry flowed from the Sunday Mass, understanding this sacrament begins with understanding the Mass itself. Every year, I take the time to interview each first Communion recipient in the parish during the weeks ahead of their big day. This is not meant as a test, but rather an opportunity to discuss the sacrament with their parents present. The children are often primed by their parents to say that the bread becomes the body of Jesus and the wine the blood of the Lord. But I also address the Mass itself, talking about the Liturgy of the Word as well as the eucharistic prayer. We talk about songs at Mass, and even the artwork and visuals that present themselves to the kids in church. 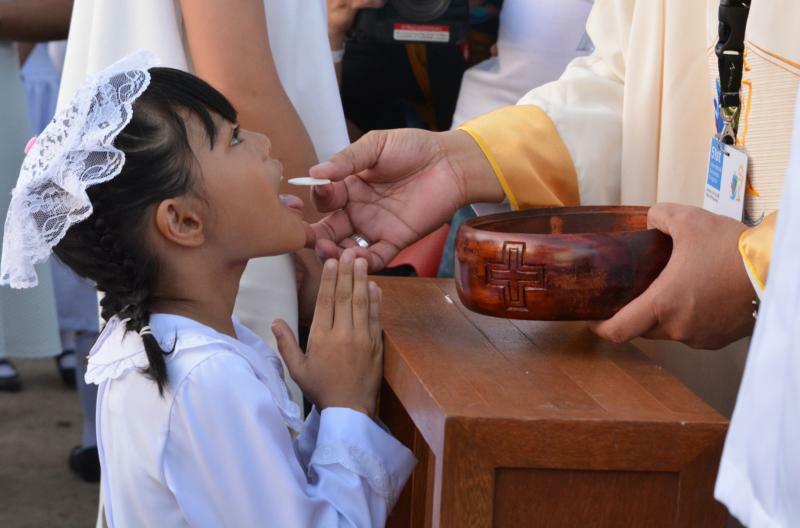 In doing, so I am reminding the children and their parents that knowing and participating in the Mass is necessary for appreciation of Communion. Understanding the Eucharist as Mass is necessary to understand the Eucharist as sacrament. Through the power of the Holy Spirit, the bread and wine become the true body and blood of Jesus, which are also the same body and blood given up and poured out on the cross. Participation in the Eucharist is participation in Jesus’ redemptive self-giving at Calvary. Reception of the Eucharist, then, is participation in both the Last Supper and the sacrifice on the cross, both Holy Thursday and Good Friday. As the Mayan men in Santiago Atitlan made so clear, the Eucharist that they carried to the sick was an extension of the Mass that had just been celebrated. They gave testimony to the reality that Christ is active on earth through their desire to share Christ’s sacramental presence with those who could not come to Mass. Quoting St. Augustine, Pope Benedict XVI reminds us that in the Eucharist, we become what we consume. Those men who had received and accepted Jesus in the Eucharist, along with the rest of the faith community they represented, were actual extensions of the body of Christ. They didn’t simply carry the body or even share the body; they became the body. The Eucharist unites and calls for ways to reach out to others. It can’t be simply about someone “getting” Communion; it is being in communion with the Lord and with others who are also with the Lord. I especially felt that unity during the five years I ministered to Catholics on death row in the state of Ohio. That was evidenced by inmate Glenn, who had just been baptized by my predecessor when I first met him. He had grown up with no faith or religious practice. For him, baptism was truly the beginning of a new life. Each week I would talk with Glenn and share the Eucharist. Since I had five different sections to visit, I would rotate Mass and then take the Eucharist to those in the other sections. Glenn impressed me with his deep love for the Lord in this sacrament. As Glenn’s execution approached, he asked me to accompany him to his death. The night before he was to die, I had some personal time with Glenn. After a final celebration of the sacrament of reconciliation, he and I and another friend celebrated Mass as the guards looked on. It would be his last meal. It was also one of the Masses I recall best. He received the redeemer Lord with a smile and complete trust in a God of mercy. Somehow that Mass and that final Communion highlighted that through this sacrament we are all made one in Christ, who gave up his body and whose blood was poured out for us. Father Herb Weber is the founding pastor of St. John XXIII Parish in Perrysburg, Ohio.